How does the news influence online activism? In this visualization below, I combine NPR news stories with data from whitehouse.gov to show how the news cycles relate to online petition signatures. In February 2013, I attended a hackathon at the White House. 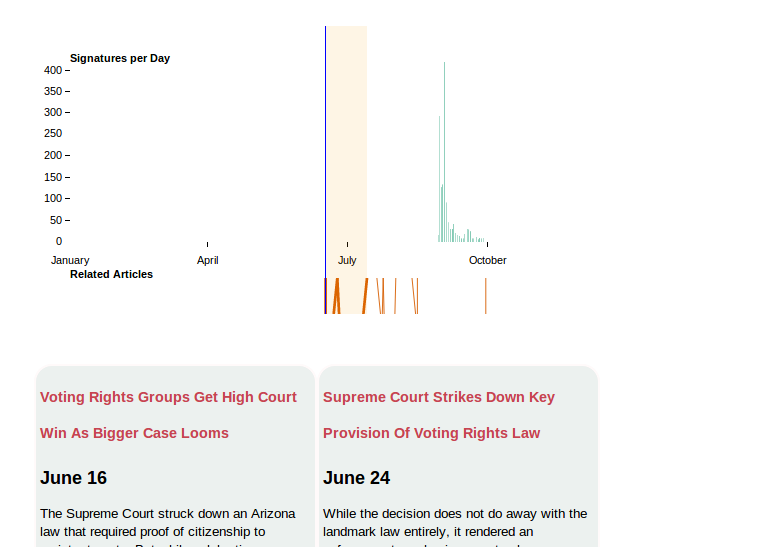 My goal was to create a visualization to show how whitehouse.gov petitions relate to media coverage of petition issues. This project didn't get done during the event for various reasons, but as part of a 2013 wrap up, I decided to finally make this happen. I hope you enjoy it! Be sure to leave a comment about any interesting results that you find! Just copy the url, since it encodes the visible graph. It's interesting to see storms of signatures as news coverage intensifies, such as for war with Syria. Other issues start out with lots of engagement, but fall off the radar quickly as media coverage shifts, as with theNSA phone metadata collection or the debt ceiling. In other occasions petitions can start with a flurry, die down, and then rekindle as new coverage returns, such as with Edward Snowden. Enjoy clicking through all the petitions and dragging the article slider around. There are definitely some nut jobs, but the in all this provides a nice way to see how new stories spur online engagement. Note that you can click and drag on the graph to make different news stories visible. I'm just starting off with interactive visualizations, so sorry if this is not be clear! I have a "how it was done" post in the works. The petition data comes from the White House Petitions API and the articles are all from NPR. Having multiple news sources would give more interesting results, but I don't know many other good open sources of news articles. Leave a comment below if you know some good ones! The code for this is all on GitHub too, so feel free to play around with it. The GitHub code is not a complete working example, as I'm waiting on a new bulk petition dump from the whitehouse (I got my data from scraping the API). The analysis part is there though. There are definitely some spurious articles in here that didn't actually match their petitions, but I'll be working on that as well. Hope you found this data set as interesting as I did! When running a user survey, how should you ensure that you are getting legitimate answers? What hints can you use to build appropriate models, and how can you quickly get an initial model out. How do we find the major color components in a picture? What color exactly is Anders' shirt? What geographic trends are there in snapchat usernames? Why all the "5820" users in Colorado, and "gato"s in Florida? Let's dig with some interactive visualizations and find out! How does the news influence online activism? In this visualization below, I combine NPR news stories with data from whitehouse.gov to show how the news cycle relate to online petition signatures. How to efficiently petition a social netowrk across multiple servers. Complete with an IPython notebook. How to start a math flavored blog using Pelican, Amazon S3, and MathJax.